Ever see digital marketing and wonder how it was made? You KNOW not everyone is hiring out for all of it, but you aren’t sure how such relevant and awesome content is produced. Some of it is skill and experience, but much of it is using the right tools. In the wrong hands, the right tools still won’t produce great results, but most people can learn, so with a little bit of time, the sky’s the limit. 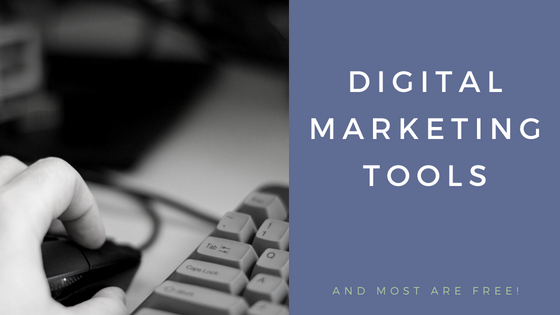 So, here is my list of my favorite digital marketing tools, with a brief synopsis. And, best of all, my favorites all have a free option. You can’t be sending out bulk emails from your personal email account. Utilizing one of these tools will keep you in legal compliance as well as giving you other features like allowing you to track your open rates, schedule when emails are sent, create drip campaigns and much more. MailChimp has a free level and is the most popular for small and mid-size businesses. Newer cloud-based tools have developed to help facilitate social media posting and basic printing needs like flyers. Older non-cloud based programs like Photoshop or Publisher are pretty clunky and make it hard to get the type of results that these tools provide. Canva is by far the most popular and has both a free and paid version. Since you can’t go to Google and just take those images…you know that, right? copyright issues and all that jazz…knowing a few good stock photography sites where the you can use the photos in any way for business or not is key. Both these sites have free photography, that you can use for any purpose. Unsplash tends to be a bit more trendy, where Pixabay is a good mix of everything. If you’re working on a team, with clients or just want to keep things organized for yourself, numerous solutions are out there. Trello is basically a post-it board system. It’s really flexible and well integrated with other platforms. The main platform is free and you can pay for extras or business class. See an example of a Trello board where I list and organize all of the info on this page!